“Mary Poppins” is a magical musical. In the hands of a professional company with lots of resources, that magic can readily happen. But community theater may have a hard time getting all those magical components – like a flying nanny – into the show. Nate Adams directed the show and has a first-rate cast to work with – a lot of veterans of local theater – and created the magic. This is a show that resonates because of the outstanding performances. What really stands out is the understated quality of the characters, which makes them all seem very real even in unreal situations. Mary does not rush or gesticulate, or seem in awe of her abilities. Instead she is calm and controlled and totally unaffected by the fact that she can fly, among other super human attributes. The kids are not overly cute or fluttery, but, well, just kids, which makes them most endearing. Mr. and Mrs. Banks are not overly dramatic – even in the face of economic hardship – which makes them seem like people we know. All the scenes which are so anticipated, including “Supercalifragilisticexpialidocious” and “Step in Time,” are a rousing success. 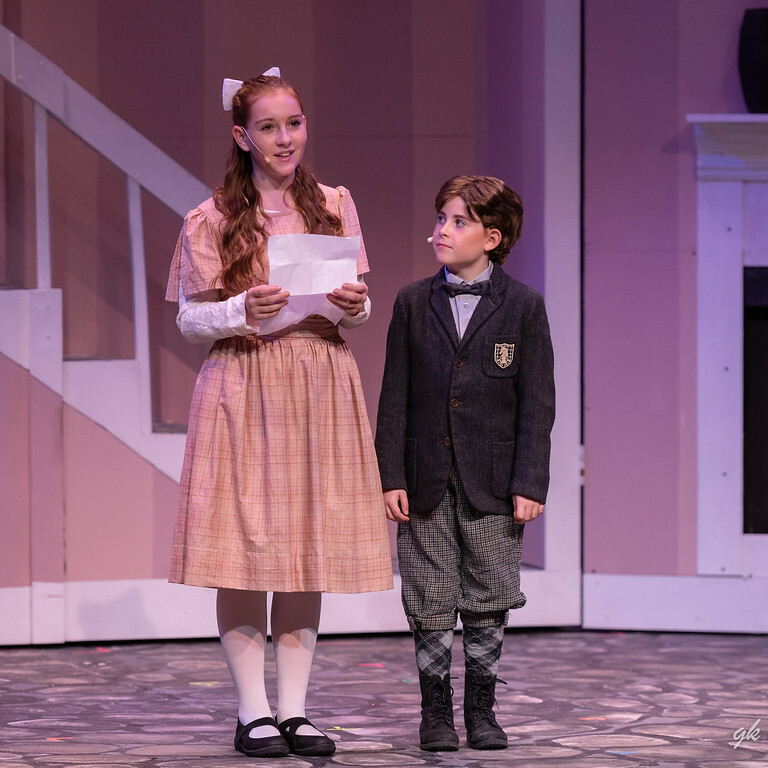 After several nannies quit, the family is surprised at the sudden appearance of Mary Poppins (Briana Rose Lipor), who announces that she will be the new nanny. Like the angel in the film “The Bishop’s Wife,” who comes to show the bishop how his broken family can be fixed, Mary’s job is to put the Banks family back together. Only they don’t know that. As Mary begins to take over the household, we see the children responding to Mary’s fantasy world in which a boring walk in the park becomes an adventure without cost. “No charging for the trees and sky,” says Mary. And, like Scrooge in “A Christmas Carol,” George’s transformation is full speed ahead as he simply says, “There are more important things in life than making money” when he meets with the bank president. This is an utterly delightful show, from start to finish. 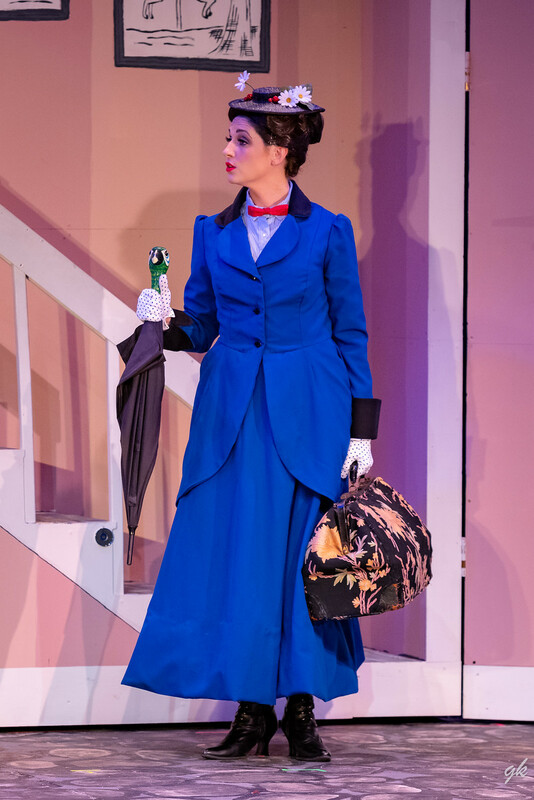 From my first view of Lipor’s Poppins standing center stage -- impeccably dressed and coiffed (black boots with a sensible heal at a perfect 90-degree angle)—I knew this show would attend to detail. And indeed, it is special. Lipor is lovely and trim as Poppins, wearing Lisa Quinn’s stunning outfits in blue and red, straight and tall like a stern schoolmarm. Her character is no-nonsense, yet can be sweet and kind, carrying off all the whimsy and magic like it’s nothing at all and with a soprano voice that soars effortlessly as well as graceful movements and demeanor. I love the understated, natural quality about Lipor and the whole Banks family, which is at the heart of the story. Allen and Gray – who always excel – are a wonderful pairing, both with superb vocals and characterizations. And the children – oh my, what special performances. Flint, a third-grader, is just a charming Michael, with outstanding understanding of her role. She works well with Vitrano as Jane, who also is wonderful. I often find children punctuating phrases in a cloying way and over- exaggerating, which would have been easy here, but it thankfully didn’t happen. Both also have sweet, pitch perfect voices and they nail their British accents. This quintet, especially, looked really sharp in appearance and in everything they did. Welch is also appealing as Bert, leading the ensemble of sweeps and lending his most pleasant baritone to tunes like “Chim Chim Cher-ee.” He leads the ensemble of “sweeps” who handle brooms and other props and choreographer Ashley Patin’s tricky footwork with ease. The cast also capably handles the incredible high-speed hand gestures in the “Supercalifragilisticexpialidocious” scene – with its whimsy and kaleidoscope of colors -- which is reprised at the end with precision. The audience loved it. Antoinette Stikl as maid Mrs. Brill contributes several doses of comedy while Liz Norton belts out a heartfelt “Feed the Birds” as the Bird Woman. A six-piece orchestra led by keyboard player and music director Mike Mrozek handled the hummable music well, though they sometimes sounded a little thin, as did the ensemble on some numbers. 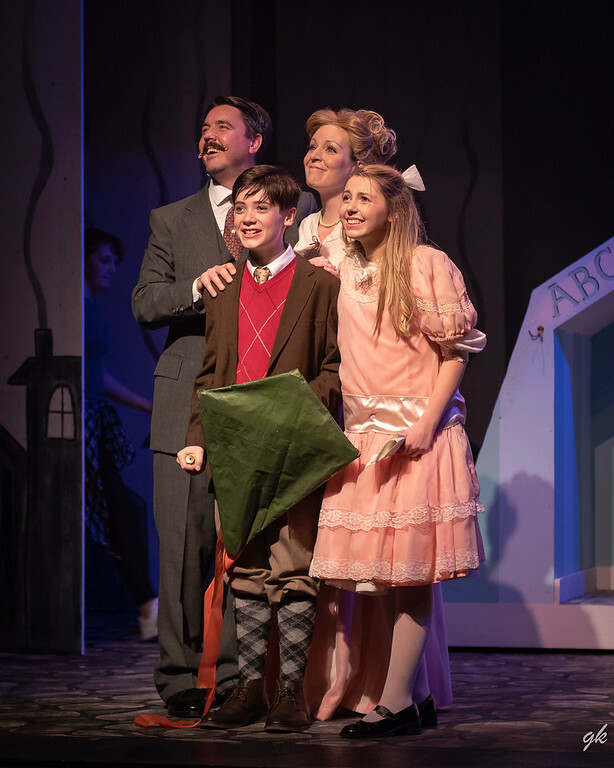 Scenic designer Matthew Carr had his hands full with sets that moved from the Banks home to the park, bank, kids’ room, rooftop. The crew beautifully handled all the large set changes, plus pulling off all of Poppins’ and Bert’s aerial feats without a hitch.